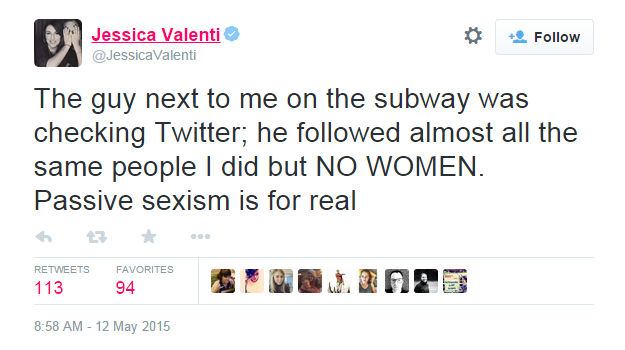 Jessica Valenti is a feminist blogger of note whose work often appears in The Guardian‘s U.S. outlet. It can’t help but be said that some of her rhetoric can be counterproductive to her goal of gender equality. She rejoices in misery experienced by men. She opposes the exchange of ideas she doesn’t happen to like. She tortures logic beyond all recognition to try to get some return on all of the chips she shoved to the middle of the table in the UVA/Rolling Stone matter. Her deliberately inflammatory work results in a great deal of heat, but no light. Instead of searching for truth, she is working a priori from the straitjacketed conclusions enforced by her brand of feminism. She is welcome to publish and to speak, of course. I, for one, welcome opposing ideas and enjoy wilting them under the scrutiny of reason. Ms. Valenti did, however, say something on Twitter today that I felt was–yes–problematic and indicative of why the authoritarian left both succeeds and why it is harming us so deeply. The Internet being what it is, people responded to Ms. Valenti’s tweet. Many supported her and many asserted she was acting in a creepy manner that she would claim was unacceptable were the genders reversed. It was interesting to see that many of the latter were women. A self-pitying eagerness to cast yourself as a victim, and an accompanying narcissism, which allows you to tell others just how much you have suffered. You see, not only is everything all about her, but the logical criticism of her statement is further proof that she is right! Ms. Valenti is a brave crusader against those who would end the “passive sexism” of deciding which of your Twitter followers are visible to those who creep looks over your shoulder? The concept is hard to parse. So Ms. Valenti said something unhelpful that will earn her more hits because that’s all that matters. The day does end in “y” after all. Why bother to tell the story? Well, something else happened today. Yet another secular blogger was murdered in cold blood by Muslim extremists who hate free speech. Ananta Bijoy Das was hacked to death in Bangladesh for the “crime” of criticizing Islam. Das was brave. Das knew what it meant to take risks to argue in favor of freedom. Those of us who argue in the relative safety of the West have slightly less to complain about; shallow provocateurs such as Valenti have lesser still. I am not so ignorant as to assert that Valenti has no empathy for Das or men like him. (She does, it must be said, brag about bathing in male tears…) I do think it is fair to assert that her priorities are problematic. Instead of engaging in honest, open debate, she distorts all criticism to shine a light on a problem that strains the definition of the word to its breaking point. Her lack of introspection prevents her from manning a table in the marketplace of ideas. And what is an article without an idea? Nothing but worthless clickbait. Instead, let us endeavor to be more like Ananta Bijoy Das and Washiqur Rahman and all of those men and women who live up to the Enlightenment ideals that most of us share.